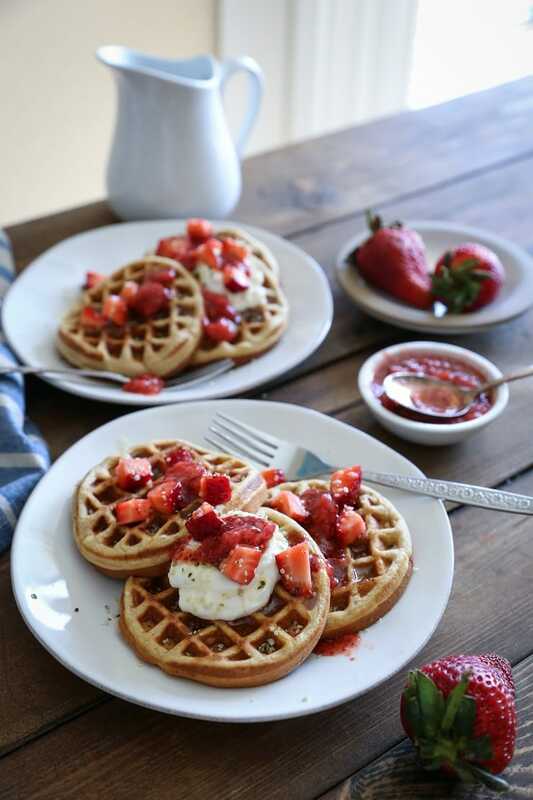 Grain-free almond flour waffles made quickly and easily using your blender. Top these paleo waffles with your favorite goodies for the ultimate breakfast or snack! 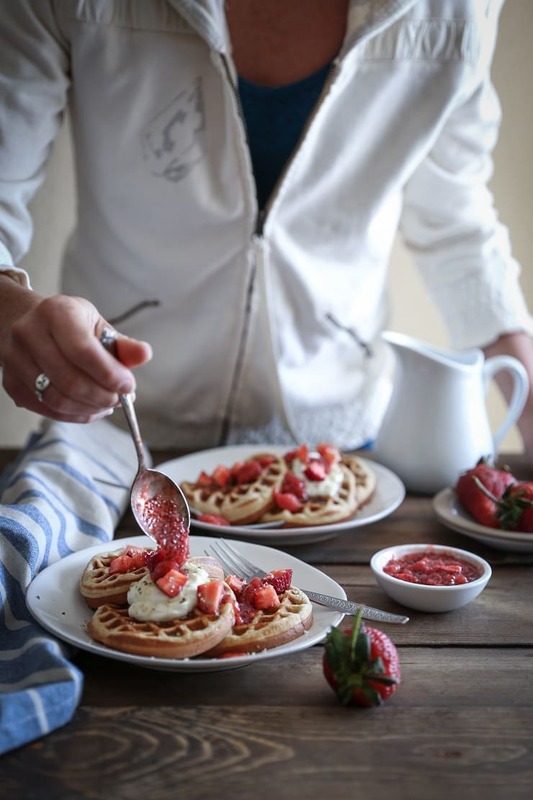 I’ve never fancied myself a particularly polite eater, and waffle feasting is no exception. I really think waffles were designed to be eaten with the hands. I’ll set out to slay a waffle or 5, and although the experience begins with said waffles neatly arranged on a plate (or in a bowl, because that’s how I roll) with inappropriate amounts of toppings, I always seem to drop the fork, scoot the toppings to the middle of the waffles, and eat them like tacos. Spoiler alert: I do the same thing with pancakes. It may be the number 1 Most Gratifying Experience I’ve had in weeks. Which is probably why waffle tacos are their own essential food group in my diet. 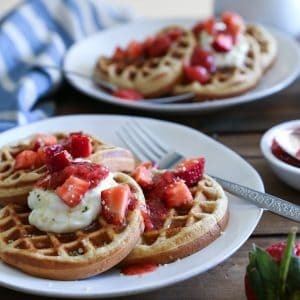 I posted this recipe for Paleo Waffles with Strawberry Compote a couple years ago using coconut flour, and I think it’s high time we re-visit the topic using almond flour, whaddya think? I use a combination of almond flour and tapioca flour, which generates an awesome waffle that holds together with flying colors. Way I see it, you want them sturdy, you know, for all the topping, stacking, and folding you’ll be doing. You can get funky fresh with this recipe by omitting the oil and adding one large ripe mashed banana. You can add fresh or frozen blueberries to the batter, chocolate chips, you name it, this is your rodeo. For an ultra rich waffle, use full-fat coconut milk in place of almond milk. Truth be told, I usually eat my waffle tacos as a mid-morning or afternoon snack. I make waffles ahead of time and eat on them throughout the week come 10am or 2pm-ish when there’s a lull in energy. 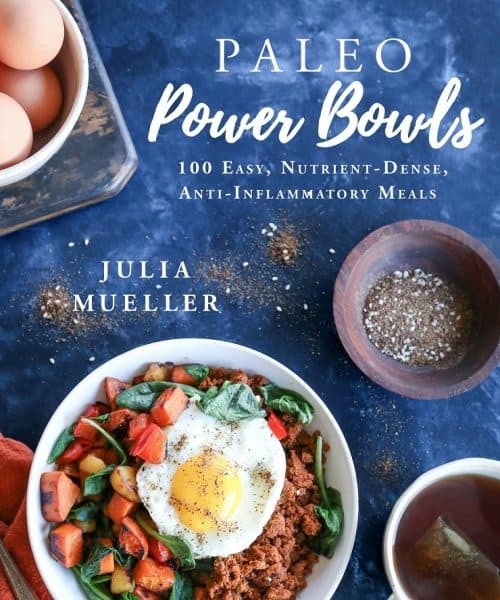 You see, I’m just so into my morning veggie scramble, that I reserve other breakfast foods like pancakes, waffles, oatmeal, and/or chia seed pudding for when I’m foraging for snacks. Toppings? I thought you’d never ask. I topped these beauties with a dollop of coconut whipped cream, strawberry chia seed jam, fresh chopped strawberries, hemp hearts, and honey. Go big or go home, as they say. You can also go with your favorite fresh seasonal fruit, yogurt or nut butter…get frisky! If you don’t use tapioca flour in your baking regularly, you can omit it from the recipe and replace it with 1 cup more almond flour. 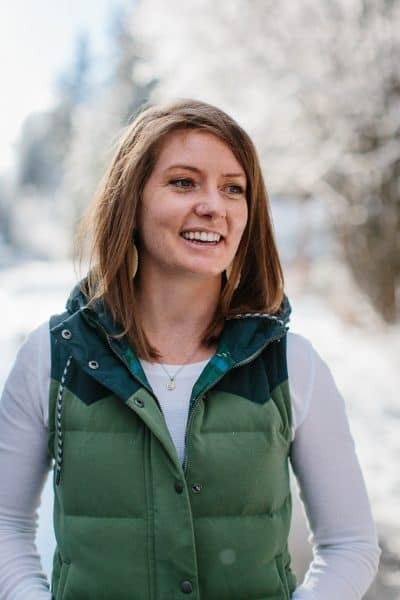 If you need an AIP version of waffles, check out this amazing recipe from Tasty Yummies for Autoimmune Protocol Waffles. I used a mini waffle maker to prepare these waffles. It made 9 small waffles, so if you use a regular-sized waffle maker, you should end up with 4 or 5 full-sized waffles. Get them tacos…err…I mean, waffles! Add the ingredients for the waffles to a blender and blend until smooth. Allow batter to sit 5 minutes. Plug in your waffle iron and lightly spray with cooking oil. Once the waffle iron is hot, pour batter in the center and cover with the lid. Allow waffles to cook a little longer past the green light of the waffle iron, about 3 minutes (to 5 minutes for crunchy waffles). Repeat for remaining batter. 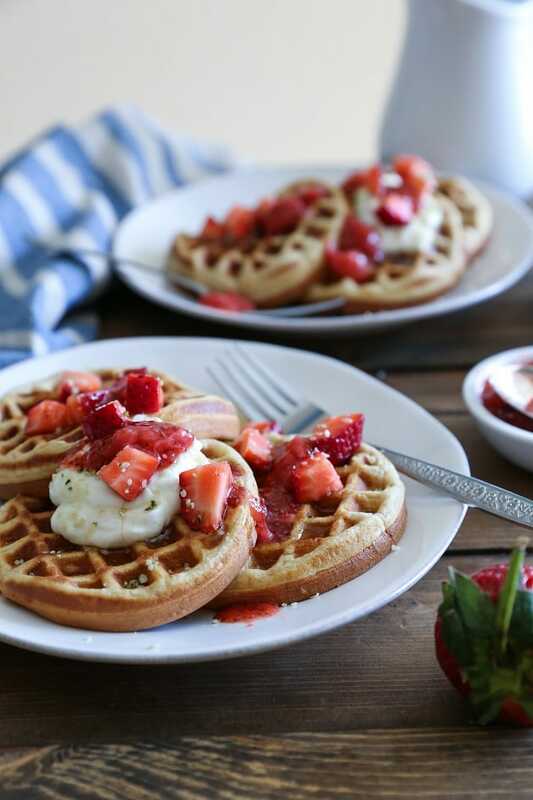 Top waffles with coconut whipped cream (or yogurt! ), homemade jam, fresh chopped fruit, hemp hearts, and/or almond butter. Get wild! Somehow it’s never occurred to me to eat a waffle like a taco. Where is my creativity? What have I been doing with my life? These waffles sound soooo completely amazing I don’t think I’d even attempt to use a fork on them. I’d just bolt them down with my hands :). Have a great week, Julia! Okay now I have to try eating a waffle like a taco! I’ve done that with pizza many times but I think I ate too many over toasted Eggo waffles in my day to be able to fold them, lol. It always amazes me what you are able to accomplish with grain-free flours. I would have never been able to guess that was the case by looking at these beauts. They’re perfect!! Thanks so much, m’lady! I’m obsessed with these waffles! 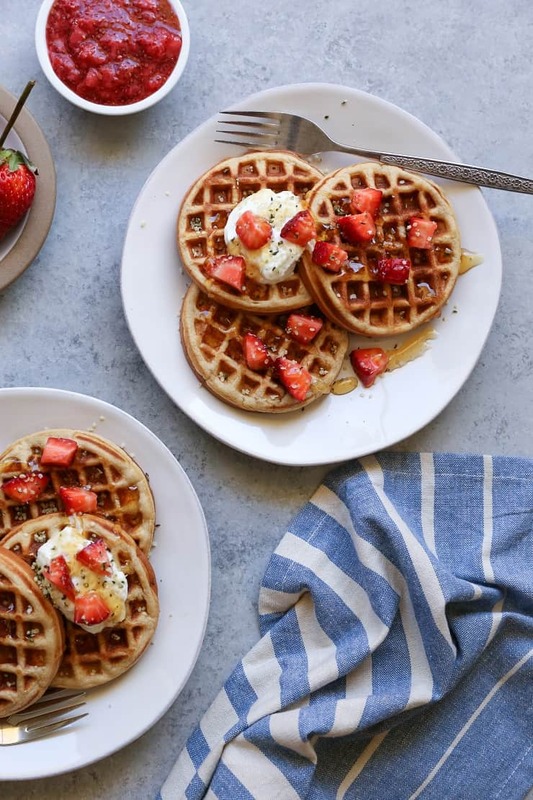 It definitely took multiple attempts to get grain-free waffles right, but now that I’ve broken the code, they’re one of my favorite go-tos for snacks. Waffle tacos for the win!! Could you make ahead and freeze them? Would they still hold? It was so uncanny as I was thinking last night, “paleo waffles…is it possible…” LOL!! No, seriously! Mmm, these waffles look awesome! I’ve been using almond flour a lot lately, and am loving it as a gluten free baking option. Yes!!! I love taco-ing waffles and pancakes. It’s the best way to eat them. For real. I can’t believe these are grain free! I love all things almond flour and will feel good about feeding these to Remy for breakfast. I just made these because I was going through boxes in the garage and found…… you guessed it! A waffle iron!!!! However, I didn’t have enough almond flour to substitute for tapioca flour…. but had a coconut flour…. well instead of grabbing coconut flour I grabbed the buckwheat flour…. I used it and I think that’s why my waffles turned out a little try and heavy….. next time I’ll make sure to be more careful, I guess I was just so excited to try them!!! The flavor was fantastic though! Perfect for that sweet tooth but without ruining your diet! These were so easy to make and really delicious. We topped it with strawberry chia seed jam and some plain yogurt and made waffle tacos like you suggested. I also gave one to my 6 month old daughter and she devoured it! I have a question about the notes. Do I replace the 1/4 cup tapioca flour with 1 cup of almond flour? It seemed likely to be too much. I love the pumpkin waffles btw. Does anyone know the nutritional info on this?Or at least the macro breakdown of carbs, protein and fat? (though I’d like to know calories as well). Thanks in advance! I added the nutrition facts to the recipe card 😀 Hope you enjoy! HI there! Thanks for sharing this recipe! I love that it is nutritious and filling. I felt that they didn’t quite crisp up enough for my liking, so I added a 1/8 teaspoon of baking powder to the above measurement. With this addition, they turn out a little more crispy on the outside, yet they still have that nice waffle chew on the inside. Thought I’d share! P.S. I’m using one of the 8 inch waffle irons, which might be why mine weren’t as crispy in the first place. Can we substitute coconut oil with olive oil instead?